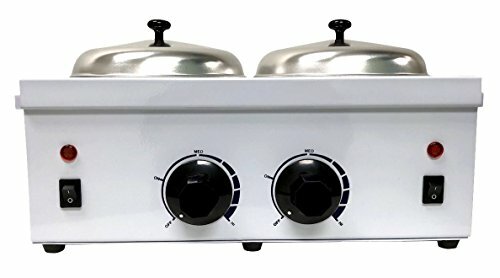 YOU ARE BUYING ONE NEW IN BOX DOUBLE PROFESSIONAL WAX WARMER! OUR DOUBLE PROFESSIONAL WAX WARMER IS THE NEWEST ON THE MARKET! WITH ADJUSTABLE HEAT OPTIONS FROM OFF TO HI, YOUR WAX WILL HEAT UP IN HALF THE TIME GETTING YOUR CUSTOMER'S IN AND OUT MUCH FASTER THAN YOUR COMPETITION. MADE OF HIGH QUALITY METAL ALONG WITH ALUMINUM POTS, YOU WILL BE SET TO SERVE YOUR CUSTOMERS FOR A LONG TIME. BOTH WARMERS RUN ON THEIR OWN SWITCH ALLOWING YOU TO MULTITASK WHEN NECESSARY. VISUAL LIGHT INDICATORS HELP YOU KNOW WHEN THIS MACHINE IS ON! If you have any questions about this product by DevLon NorthWest, contact us by completing and submitting the form below. If you are looking for a specif part number, please include it with your message.